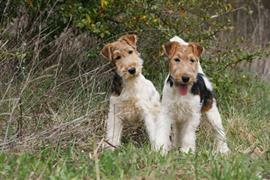 There are two common breeds of Fox Terrier. The Wire Fox Terrier has a longer double white coat. Owners of the wire variety sometimes choose names like Shaggy, Jake, and Sarah. The Smooth Fox Terrier has a short white coat. Favorites among smooth owners include Bella, Nike, and Katy. The white found in the breed's coat often leads owners to choose a color related name. Oreo, Angel, and Sugar are a few options that fit this naming strategy. A dog named Pitch, depicted in a painting by Sawrey Gilpin, is one of the earliest depictions of a white terrier. A few name ideas including Ryan, Clemens, and Grover can be taken from famous pitchers. Some of our pages will contain a subcategory. A subcategory is a slightly more specific grouping than the main topic of the page. For a subcategory, we will include a separated table of names and corresponding descriptions. An example of a subcategory of Red Dog Names would be 'Dog Names Inspired by Red Wines'. If you have any subcategory ideas for the Fox Terrier Names page, we would love to hear them. Use the form below to submit your ideas.